JUNE 20, 2014 UPDATE—Since he took office in early 2014, Mayor Bill Peduto has launched a series of Pothole Blitzes to combat the mounting pothole problem in the city of Pittsburgh. Now, after a long winter spent scrambling to fix the road hazards, Peduto says the city has finally made some real and lasting progress in its war on potholes. When Bill Peduto became Mayor, he had a huge job ahead of him. In a recent statement, he claimed that about a year ago, pothole complaints had increased by roughly 350 percent. Now, he maintains that city workers, who had to battle against a frigid winter and decades of neglect to road infrastructure, have risen to the challenge of repairing the roads under his leadership. Since the Pothole Blitzes began, Pittsburgh has drastically improved response times for patching the dangerous craters. The city now takes only five days to respond to a pothole complaint—they had been taking up to 17 days to respond earlier in 2014. Although Peduto believes that residents should be proud of what Pittsburgh's workers have accomplished so far, he says there's still more work to do. While the city is close, they have not yet reached their goal of responding to pothole complaints in three days. Blitzes aren't just for the football field anymore: Pittsburgh's New Mayor, Bill Peduto, recently announced that the city has embarked on a 72-hour blitz to fill as many potholes as possible before colder weather returns. Pittsburgh's recent roller coaster ride of extremely cold temperatures followed by a significant warm-up has spawned the creation of hundreds of potholes far earlier than expected. Some craters even measure up to 6 feet wide. Crews must work quickly and around the clock to repair the massive amount of freshly bloomed potholes—27 crews are working different back-to-back shifts over the next few days. 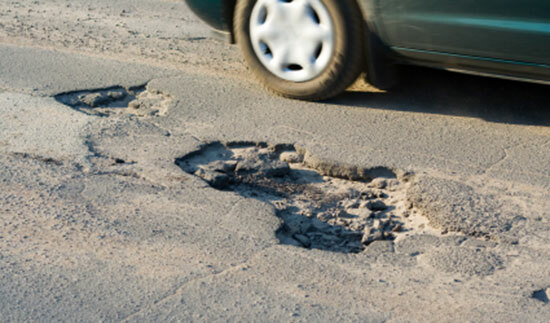 If the city neglects to fix the damage during the brief respite of warm weather, many drivers may be left at risk: patching potholes proves incredibly difficult as temperatures fall. The city government is encouraging drivers to report any potholes that they encounter. Call 3-1-1 from a local phone or submit a complaint online. Contact your local government responsible for maintaining roads. Source: “Pothole season strikes early; Pittsburgh crews begin 72-hour blitz.” Wtae.com. January 15, 2014. Source: Tide turning in Pittsburgh's war on potholes.” Bizjournals.com. June 19, 2014.